Lt. Husted reported, “[Walker] apparently knew the family of [Darlene Ferrin] as a mysterious caller. Placed three separate calls within 1 ½ hours after Darlene Ferrin’s death to each of the family members. These calls were made before media announcement of the murder and made certain references indicating the caller knew Darlene.” According to the Vallejo police reports, Darlene’s in-laws, Mr. and Mrs. Arthur Ferrin, reported that they had received an anonymous phone call on the night Darlene was killed. The call was made before the media released the names of the victims but long after the victims had been identified at the scene. The Ferrins stated that the caller said nothing; only the sound of heavy breathing could be heard over the line. Since the caller had not spoken, he could not have “made certain references indicating the caller knew Darlene,” as Husted’s report stated. A similar call had been placed to Darlene’s home approximately ninety minutes after the shooting at Blue Rock Springs Park. At the time of the investigation, police did not consider these calls to be suspicious, and instead believed that the calls were most likely made by a concerned friend or perhaps even a reporter after news spread that someone named Ferrin had been shot. Darlene’s husband, Dean Ferrin, stated that no one had ever believed that the calls were made by the killer and that police had expressed no interest in the source of these calls. Police reports confirm Dean’s statements. Years later, Darlene’s younger brother Leo stated that he had placed these telephone calls while attempting to find Darlene because he was in search of marijuana and thought she could help him. Police then questioned Darlene’s family, friends and coworkers in an effort to identify the stranger. Some witnesses claimed to recognize Walker as a man who allegedly “spent many hours at the restaurant where Darlene worked as a waitress.” Husted explained that “this has been verified by a VPD Officer, Officer [Steve] Baldino who picked the subject’s picture out of a lineup indicating he had been seen in there conversing with the deceased.” Police then interviewed Darlene’s sisters, Pam and Linda. Both sisters recalled a “painting party” held at Darlene’s home several months before her murder, and a mysterious, well-dressed man who attended and scared Darlene. Linda reportedly identified Walker as the sinister stranger but Pam disagreed. When asked about the party, Steve Baldino told investigators that he was a guest. Police then asked the babysitter, Karen, if she was willing to undergo hypnosis to remember more about the party and the stranger she had seen in front of Darlene’s house. Haynes probed further into Karen’s memory. 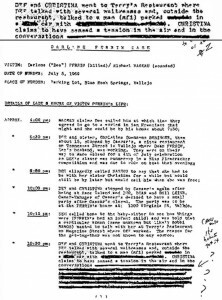 “In regard to the painting party which took place in May of 1969 at 1300 Virginia, the new residence of Darlene Ferrin, it was determined that [Karen] was, in fact, there taking care of Darlene Ferrin’s [daughter] and that the three unidentified white males arrived, and that she soon left the residence, due to the fact she was uncomfortable with these strange individuals. It’s not certain whether any of these individuals may or may not have been the suspect. She did indicate that they were young.” Despite the fact that Karen claimed that the “three unidentified white males” were “young,” later versions of the painting party story would focus on the individual allegedly seen by Steve Baldino and Darlene’s sisters Pam and Linda — a sinister, well-dressed yet older man. Pam would later claim that she had seen this mysterious man on at least eight occasions, and that Darlene warned her to stay away from him because he was a murderer. Like Linda, Pam failed to mention this potentially important information during her many interviews with police, and her selective silence and sensational stories cast doubt on her credibility. Vallejo police detective George Bawart had come to know Pam after investigating claims that she was the victim of harassment by an anonymous and threatening stalker. Bawart once told a television producer that Pam was “nutso.” Darlene’s husband Dean Ferrin told the same producer that Pam and Linda were prone to prevarication. Pam had claimed that Darlene’s cousin Sue Ayers had visited surviving victim Michael Mageau as he recovered in the hospital. According to Pam, Mike told Sue that he and Darlene had seen chased to the crime scene and the gunman had uttered Darlene’s nickname, “Dee,” just before the shooting started. Sue Ayers has since denied that she spoke to Mike at the hospital and denied that she had ever told anyone such a story. She also said that Linda and Pam were not credible witnesses and that the two sisters were responsible for many of the myths regarding the life and death of Darlene Ferrin. Both Pam and Linda would later befriend Sandy Betts, who claimed that she had been the victim of harassment at the hands of suspect Larry Kane and other suspects. Authorities had investigated these claims and determined that Betts was not a credible person. Retired reporter Dave Peterson often repeated many of the stories told by Pam and Linda, including the myth that Darlene had been spending more money than she could have made as a waitress. This claim was based on the notion that Darlene had magically obtained a large sum of money in order to buy a house, yet Darlene’s husband Dean explained that they had purchased the home with the financial assistance of Darlene’s father. Peterson was convinced that Darlene had known the Zodiac and that her alleged involvement in a satanic cult had somehow led to her murder. Peterson became an associate of Howard Davis, who claimed that the Los Angeles District Attorney’s Office and other officials had orchestrated a massive conspiracy to conceal the connection between the Zodiac murders and the notorious Manson “family” of cult killers. Officer Steve Baldino claimed that he had heard the tape recording of the Zodiac’s telephone call to Vallejo police on the night of the Ferrin murder. In an interview for the tabloid television show NOW IT CAN BE TOLD, Baldino said, “I heard it – I know there was a tape because I heard it, I think it was that night.” He added, “That tape is apparently now missing.” Darlene’s sister Pam and others also claimed to have heard the infamous tape. Baldino complained about incompetence and corruption within the Vallejo Police Department, and once stated, “I have found over the years that some people there did not care about the truth.” Rumors regarding the recording circulated in the years after the 1977 investigation, and Steve Baldino repeated the story to anyone who would listen. Author Robert Graysmith included Baldino’s story in the book Zodiac and created the legend of the Zodiac voice recording. In his book, Graysmith states that Vallejo police Detective Jack Mulanax had searched for the recording, and the detective later stated that he never found any evidence that such a recording had ever existed. None of the Vallejo police reports mentioned the recording which would have identified the Zodiac, and Baldino was the only member of the Vallejo Police Department who had ever claimed that the recording existed. Former Vallejo police dispatcher Nancy Slover answered the Zodiac’s call to the Vallejo Police Department, and she denied that she had ever played such a tape for Baldino or anyone else. She emphatically stated that the tape had never existed. Slover explained that the Vallejo Police Department did not have the equipment to record incoming phone calls in 1969, and that anyone who had worked for the department at that time would be aware that such a tape could not and did not exist. A segment of the then-popular syndicated talk show The Sally Jessy Raphael Show featured Robert Graysmith, author of Zodiac, and Pam, the sister of Zodiac victim Darlene Ferrin. During the broadcast, Pam describes the “ordeal” of ongoing harassment from a mysterious stalker. Despite the fact that Graysmith based much of his book on the stories told by Pam, he attempted to distance himself from her as she shared more incredible stories with the studio audience. Pam said, “Well, the night that [Darlene] was killed, she had come to the house, our mom and dad’s house, and I was there with the little baby, he was only ten days old. She had told my mom, ‘Remember that killing I told you about a few years ago, well, it’s gonna be in the papers tomorrow so don’t be surprised.’ With that in mind, I looked at Darlene and I said, ‘What are you talking about?’ and she said, ‘Never mind, Pam, you get home with that baby. You shouldn’t be out.’ So, my dad comes walking in the room and he says, ‘Darlene are you scaring mom with those horror stories again. You get out of here, you get home.’ So, with that, she leaves, she doesn’t tell her story, because she ends up dead at ten after twelve.” Pam never told this story to police. Darlene’s sisters Pam and Linda told many stories over the years and, by 1998, their younger sister Christina reportedly changed her version of events. In 1969, police interviewed Christina regarding the events on the night of Darlene’s murder. 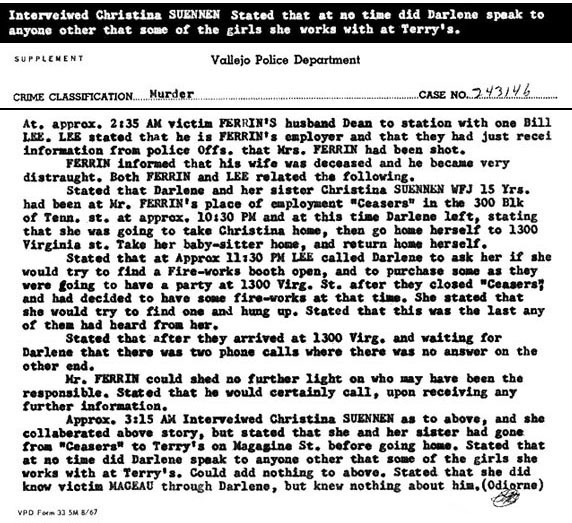 According to the police report, Christina accompanied Darlene on a drive to Ceasar’s restaurant and then on to Terry’s restaurant. Darlene then took Christina home before driving to pick up Michael Mageau. 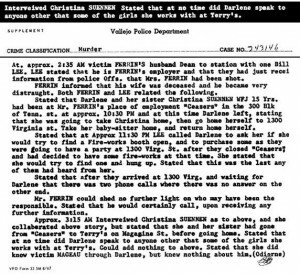 The Vallejo police report regarding Christina’s interview states: “Interviewed Christina SUENNEN… stated that she and her sister had gone from “Ceaser’s” to Terry’s on Magazine St. Stated that at no time did Darlene speak to anyone other that some of the girls she works with at Terry’s. Could add nothing to the above.” Three decades later, Christina was interviewed by Detective Johnny Smith and Manson/Zodiac theorist Howard Davis. The website TheZodiacMansonConnection.com stated: “On New Year’s Day 1998, Detective Johnny Smith and Dr. Howard Davis met with Darlene Ferrin’s younger sister, Christina. She told them that [Manson family member] Bruce Davis looked exactly like the man she saw Darlene arguing with about 45 minutes before Darlene was killed by Zodiac!” Christina had never mentioned this alleged argument when she was interviewed by police in 1969 or at any other time. Christina’s version of events changed after Robert Graysmith’s best-selling book and other accounts had stated that Darlene had argued with a mysterious stranger shortly before she was killed. No one had ever reported such argument or incident to police and no credible evidence existed that Darlene had argued with anyone on the night she was murdered. The stories about the recording, the painting party, the anonymous phone calls on the night of the murder, and the sinister stranger who terrified Darlene served as the foundations of the growing myth that Darlene had known her killer. The theory depended upon the false assumption that police had failed to properly investigate the murder of Darlene Ferrin. The few critics of the investigation failed to note that the police could not investigate leads which witnesses never bothered to report and that police had already investigated many of the dubious claims made by Darlene’s sisters and others. Years of investigation had failed to produce any credible evidence that Darlene had been the victim of a stalker or that she had known the Zodiac. The myths persisted, and the story of the painting party expanded to include Ron Allen (the brother of suspect Arthur Leigh Allen), as well as the sinister, older stranger wearing a suit. Several of the named guests –including Ron Allen– denied that they had ever attended such a party, but the story was featured in Robert Graysmith’s book Zodiac. After reading Graysmith’s book, Arthur Leigh Allen’s original accuser Don Cheney claimed that Allen’s brother and sister-in-law had attended such a party with Allen and that the suspect had worn a suit. Both Ron Allen and his wife refuted Cheney’s claims. Cheney’s new story served as a classic example of the problem which continued to plague the Zodiac mystery and continued to confuse the public in search of facts about the unsolved case. Pam, Linda and a few others spread sensational stories which were then reported as fact in Graysmith’s best-selling book Zodiac. The fact that Graysmith’s book had been published and became a best-seller was cited as proof its factual accuracy and the author’s credibility. The media then used Graysmith’s revisionist account as a source for more news reports, lending further credibility to Graysmith’s version of the story and the claims made by Pam, Linda and others. These media reports then influenced amateur sleuths and Internet crime buffs who perpetuated these myths and invented new theories of their own based on those myths. In turn, the Internet speculation and rumors fueled more myths which were then reported by the media. By the year 2007, many of these myths were included in the film adaptation of Graysmith’s book, thereby spreading these stories to millions of viewers across the globe and creating more Internet speculation. These Internet crime buffs then embraced the movie version of the story and cited the fact that the film was based on Graysmith’s book as proof of its accuracy. In turn, observers then concluded that Graysmith’s book must be factually accurate because the book was turned into a Hollywood film. Despite the overwhelming evidence which proves that Graysmith’s version of the Zodiac story is distorted, biased and factually inaccurate, the public and the media continue to cite the author’s revisionist account as fact and continue to spread the myths regarding the life and death of Darlene Ferrin. These myths were also prominently featured in Geraldo Rivera’s tabloid television show NOW IT CAN BE TOLD.